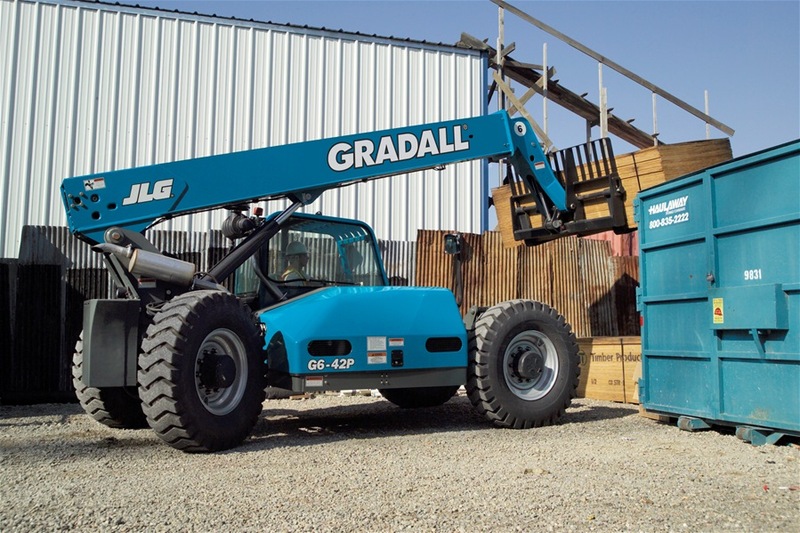 The Gradall reach forklift is a name that is popular with most residential framing contractors here in Southern California. But it’s strength and ease of use are not only for building homes but many other trades as well. Material stocking, roofers, plumbing, masonry and steel contractors, they all know the value and capabilities of the Gradall brand. West Coast Equipment offers Gradall Rentals of all sizes from the Gradall G6-42P with it’s 6600 lbs of lifting capacity and 42 foot of reach to the 534 D9-45 with 9000 lbs capacity and 45 foot of reach. 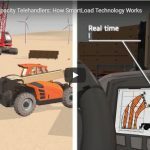 These two lightweight machines get the job done when your workload is on the lighter side. The next two machines are the 10,000 lb class. We offer the 534 D10-45 with 10,000 lbs of capacity and 45 foot of reach . The big brother is the 544 D10 -55 with 10,000 lbs and 55 foot of reach . 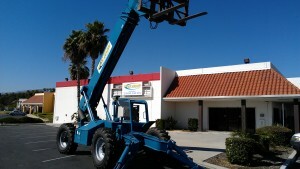 For all of your Gradall reach forklift rental needs in Southern California contact West Coast Equipment. 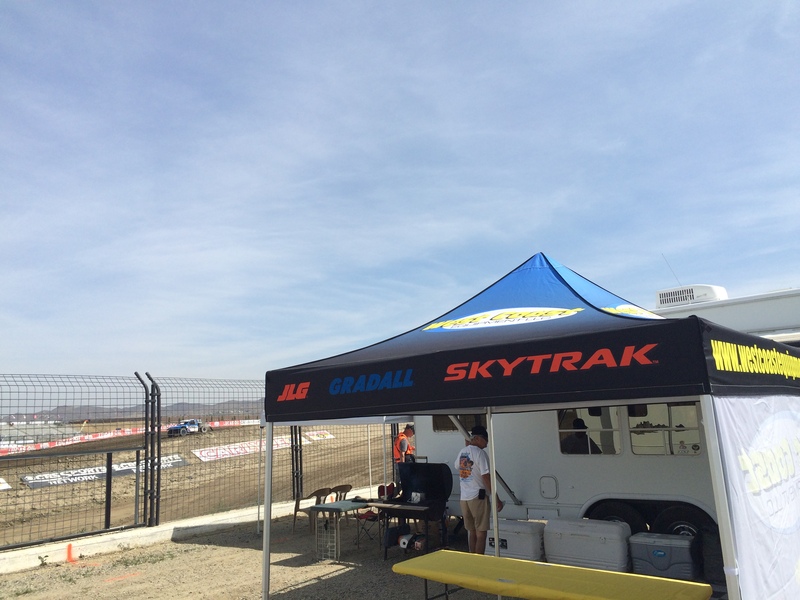 Saturday May 30 and Sunday May 31 2015 West Coast Equipment had their first customer appreciation day at the Lucas Oil Off Road races at Lake Elsinore Motorsports Complex. Over 60 of our customers and family members attended the two day event to watch some of the best off road racers battle it out on the purpose build short course track. Our track side VIP RV spot gave us one of the best seats in the house and provided a nice hospitality setting for lunch, cool drinks and much needed shade as the temperatures reached into the upper 90 degrees. 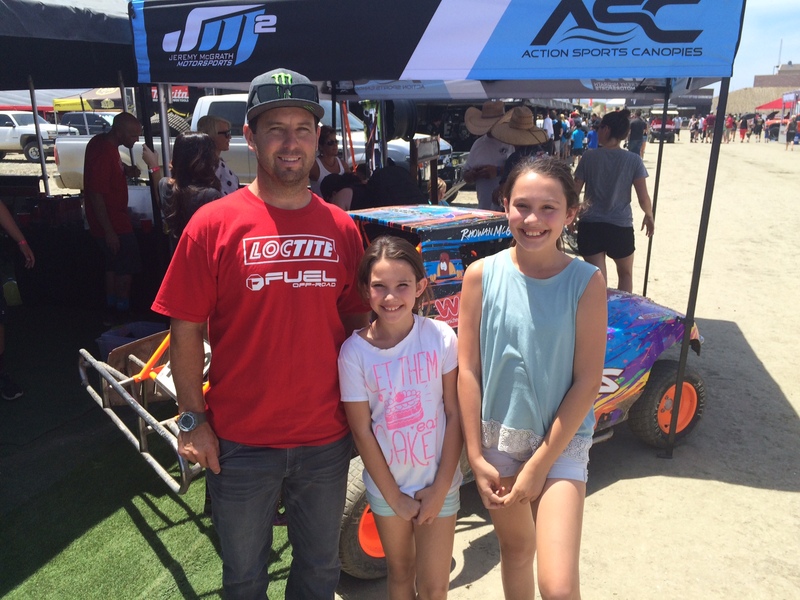 The heat did not stop the West Coast Equipment visitors from walking the open pit for autographs and pictures with the drivers like Jeremy McGrath, Brian Deegan, Twitch Stenberg, and many other very approachable racers that always take time to meet their fans.These 850 h.p. off road trucks are a must see in person ! Flying and sliding their way around the 1.5 mile short course track, the battles between the drivers for top position often results in missing body panels or a truck or two upside down. These drivers do not hold back from touching wheels or being scared to ” throw it side ways ” at full speed. If you have never been, think about joining us at the next event in July, a night race a Glen Helen in Devore, Ca. West Coast Equipment Would like to thank all of our customers new and old that attended our customer appreciation day at the races. We hope to see you again soon and hopefully it will not be as hot ! 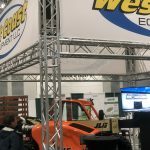 Thanks to Lucas Oil and Robert Myles for allowing West Coast Equipment to provide a Skytrak reach forklift, a JLG boom lift and a JLG reach forklift before and during the event weekend. Our equipment helped the Lucas Oil off road production team with setting up their equipment track side. 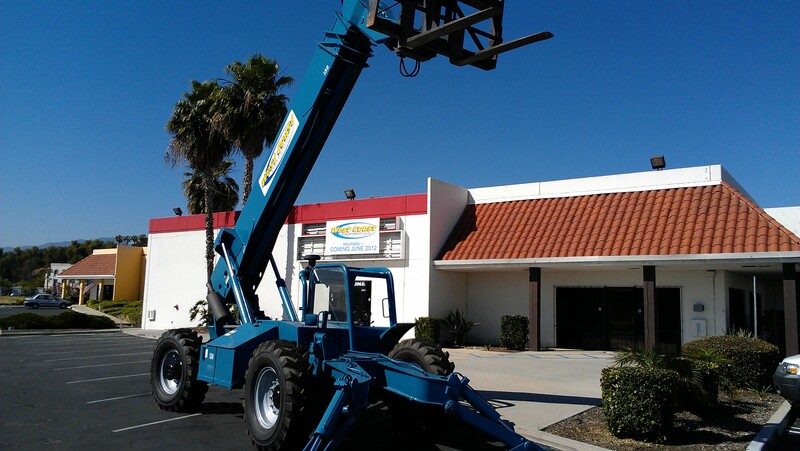 West Coast Equipment is a independently owned equipment rental company in Corona California. 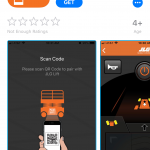 A JLG factory authorized distributor for JLG, Skytrak and Gradall reach forklift and JLG boom and scissor lifts. Our one location delivers rental equipment across Southern California and provides new and used equipment sales and service. The Pro 2 trucks battle for the lead in the first turn. Track side at the Lucas Oil Off Road races. West Coast Equipment had front row seats at the VIP RV spots for Saturday and Sunday races. Driver of the No. 2 Loctite Chevy Pro 2 Jeremy McGrath with two of his fans. West Coast Equipment provided a Gradall forklift rental to the Builders 4 Babies diaper drive hosted by Home Aid Orange County held on May 1, 2015 in Costa Mesa, Ca. Local building contractors participated in this event by creating miniature homes encased in diapers that will eventually be donated to families in need. The event was judged in several different categories of style and appearance. Sub – contractors participated by building the homes on site creating a fast paced working job site assembling walls, roofs, exterior designs and landscaping. Our West Coast Equipment Gradall 524 LoPro forklift helped by moving the materials around that were used to complete the miniature homes. Here is a bit of info captured from the Builders 4 Babies Facebook page. We want to thank all who donated at the Builders 4 Babies event! We gathered over 1 million diapers! ‪ Here are the awards given to the builders for their participation. Thanks everyone for a great event!! See you next year! Completed diaper house with exterior landscape and water feature. West Coast Equipment Gradall 524 LoPro forklift doing it’s job, unloading another pallet of diapers. Watch out diapers on board ! This is easy work for our Gradall 524 LoPro forklift! Circle M Contractors Inc. was in charge of the Gradall 524 LoPro forklift. Look for our new facility in Corona off the 15 freeway. June 1 ,2012 we are scheduled to move into our new facility in Corona Ca. The new location is 18,000 square foot of in-door service area including our walk in will call desk. The new location is perfect for servicing LA, OC ,San Diego and the deserts from our location alongside the 15 and 91 freeways. We are looking forward to the new location to provide us with a more visable location to contractors that use Gradall, JLG and Skytrak telehandlers.